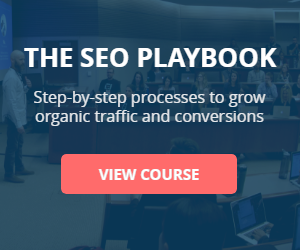 Note: I just launched my premium training program, The SEO Playbook. You can learn more about the course and see what current students are saying here. Most on-page SEO checklists are completely useless. You get 3.6 million results! Most of them offer nothing more than a bullet list of incredibly basic advice. “Include your keyword in the title tag”. “Make sure your site loads fast”. It takes a crap load of time! In this 20-step checklist, I’ll be focusing on the top on-page SEO ranking factors pulled from several reputable industry reports. We’ll look at supporting data, and provide action items for each checklist element. I'm giving away a free ﻿﻿Google Sheets template that automates most of the boring stuff for you. NOTE: Thanks to Joshua Hardwick (from The SEO Project) for creating this template! I’ll be walking you through template setup (and the whole optimization process) later in the guide but first, let’s talk a bit more about on-page optimization. 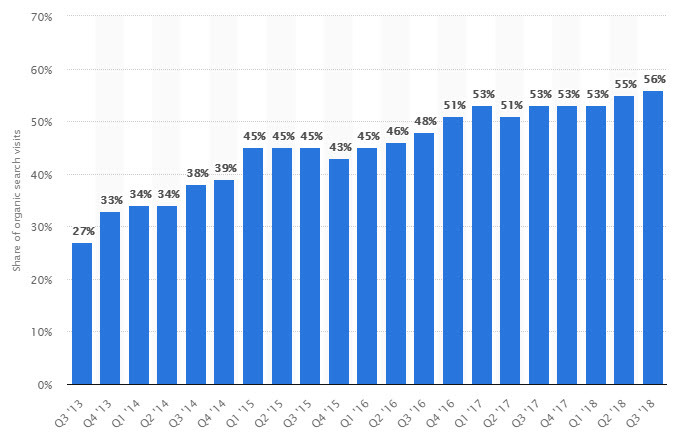 Is on-page SEO still important in 2019, and what key on-page ranking factors should you be optimizing ? Let me begin by answering the first part of that question. On-page SEO is definitely still important. It often gets overshadowed by other off-page factors like backlinks and domain authority,. Looking at this, you’d be forgiven for thinking the “on page factors” listed here aren’t important at all. They look negligible next to those other factors, right? Backlink factors take months/years (and a lot of cash) to build. Meanwhile, a keyword can easily be added to a title tag in <60 seconds, and your internal and external link profiles optimized in minutes. 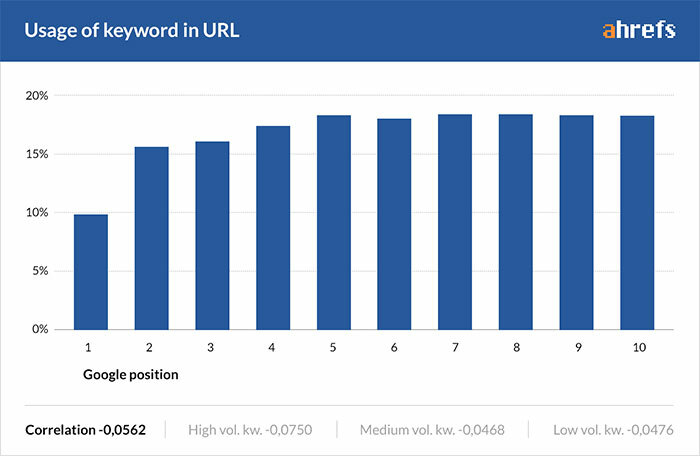 While this study shows “keyword in title” as 4-5 times less important as “referring domains”, it’s important to remember it takes less than 4-5 times the effort to change! Before you start investing loads of time and money into content and link building campaigns, focus on the foundational elements. On-page SEO falls in this bucket because it’s what search engines like Google use to understand the context of content, determine relevance for different search queries, and gauge user experience. Get this part wrong and you’ll be fighting an uphill battle. You have very little control over both of these things. Your keyword is either in your domain name…or it isn’t. Your page is well-aged…or it isn’t. Don’t let this worry you; everyone else is in the same boat. Focus on the factors you do have control over. The majority of on-page SEO advice you see online centers on the strategic placement of exact match keywords within core page elements - title tag, headings, URL etc. While keyword placement is important, more complex factors such as intent and overall relevance of a page/post are now being weighted heavily by search engines. You'll notice that the exact search term "guest posting" is only showing for one of the top ranking pages. Google sees articles about "guest blogging sites" and "guide to guest blogging" as relevant topics to that search query. When you're looking at on-site optimization don't fall into the trap of ONLY focusing on exact match keywords. Look for partial match, synonyms and semantic keyword variations (more on this later). This will help boost keyword spread, and strengthen the overall topical relevance of your page. Want to learn more? 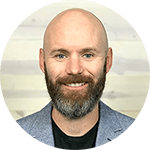 In this video, I’ll show you how to quickly find dozens of secondary keyword variations to help expand your organic footprint. It supports up to 1000 web pages at a time! This is the “START HERE” tab, which contains detailed instructions for each step of the process. This is where you’ll assign a target keyword/topic for each page on your website. This is where you’ll see the results of the automated on-page audit for EVERY page on your website. While the spreadsheet automates most of the top on-site SEO elements, there are still some factors that can’t be checked automatically (e.g. readability of content, internal/external link assessment and LSI evaluation). I’ll cover these towards the end of the post. To do this, click the link above (to get access to the spreadsheet) and go to “File > Make a Copy…”. You should now have an editable copy of the template on your own Google Drive. So, how does this template actually work? Check the “DONE” tab for SEO recommendations! All set up and ready-to-go? Any page with the “noindex” tag applied to it WILL NOT be indexed by search engines. If you want a page to rank (for anything! ), it MUST be indexed. If the spreadsheet kicks back a “noindex” tag for a page you want indexed, you’ll need to remove it. If the page shouldn’t be indexed, no worries, you can leave the “noindex” tag where it is. It could be argued this is more of a technical item, but one of the biggest mistakes I see when performing SEO audits is people inadvertently restricting search engines from accessing key content. 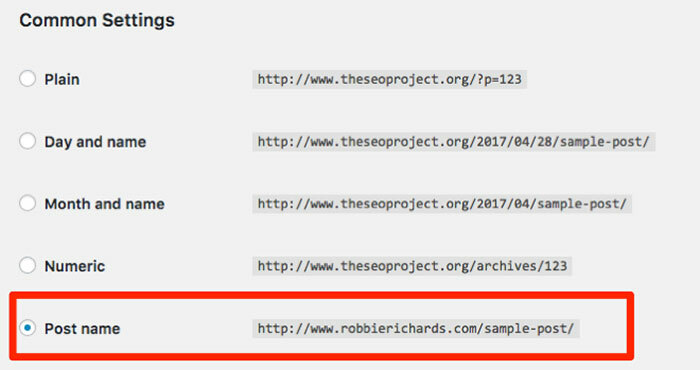 Make sure your URL and/or subfolders are not being inadvertently blocked in the robots.txt folder. Or remove the folder or page-level exclusion from your robots.txt file. Once the page exclusion is removed, re-submit it to the index using the Search Console URL Inspection Tool. Without getting into the technical details, Hyper Text Transfer Protocol Secure (HTTPS) is the secure version of HTTP - protocol over which data is sent between a browser and your website). The 'S' at the end of HTTPS stands for 'Secure' because all information exchange between the browser and your site is encrypted using an SSL certificate. Google officially stated announced they use HTTPs as a ranking signal way back in 2014. And the data suggests this number could climb to 65% by the end of 2017. A page that isn’t using HTTPs will be indicated by the phrase “NO” (and red cell highlighting) in the “HTTPs” column of the spreadsheet. If you see this, it may be worth making the switch, because Chrome will soon start to label all non-HTTPs pages as “not secure”. As you can imagine, this could have a BIG impact on the conversion rate of websites, especially in industries such as ecommerce where visitors are entering personal and transactional information. A study by GlobalSign found 84% of users would abandon a purchase if data was sent over an unsecure connection. Lets Encrypt supplies free SSL certificates that are compatible with most web hosts. You can also go with a quality hosting provider like WPX hosting. I use the company for all my site hosting, and recommend them to most of my clients. Register both domains http & https in Google Search Console, including your www and non-www versions. Prepare & test the Rewrite Rules that will 301 redirect the old http site to the new https version. Update the robots.txt directives with new https protocols. Upload & Verify new https XML sitemap within Search Console. Pick a preferred version of the site and ensure all other possible variations are properly 301 redirecting to it. For a comprehensive HTTP to HTTPs migration checklist, check out this awesome post by Aleyda Solis. And that number is on the rise! 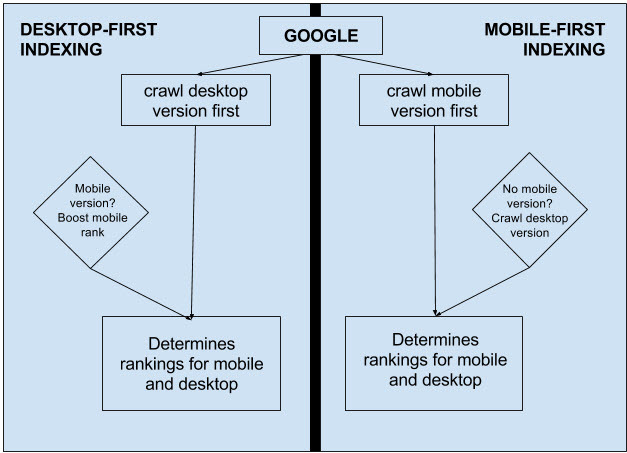 In a nutshell, Google now uses the mobile version of your website as the starting point for what it includes in the index, and a baseline for it determine rankings. Lack of a “mobile-friendly” website can now negatively impact your rankings on both mobile and desktop devices. Google started penalizing mobile-unfriendly websites in 2015. It’s super important your website is optimized for mobile devices. It should either utilise a responsive design or have an alternate mobile-friendly site. I’d recommend correcting this problem ASAP if the spreadsheet kicks back an issue. According to official Google statements, more than 50% of search queries globally now come from mobile devices. And, this number is only going to rise. If the automation template kicks back a "mobile-unfriendly" warning make it a #1 priority to get it fixed. Sometimes the fix can be quick, simple and have an immediate impact on your mobile rankings and user experience. It’s good practice for every web page to feature a H1 tag. It’s also good practice to include your target keyword (or at least a variation of it) in your H1 tag. Google looks at H1 tags for clues around page context. If you add multiple H1 tags with different keywords it becomes harder for Google to definitively extract context from the page. Some people also believe having your keyword at the beginning of your H1 gives a slight boost (note: this has never been confirmed by any reputable study). H1 starts with keyword — again, this isn’t a must-have so don’t force it; it may make sense in some instances, though. A reminder to not fall into the exact match keyword trap here. Always think of your H1 tag as, well, a headline for your page/post. The most important thing is that it actually describes what the page is about. Sometimes content management systems like WordPress will automatically use H1 tags to increase text size within random page sections. This can lead to multiple (or duplicate) H1 tags. Check out your site code to ensure you're using a single H1 tag on each post, and unintended text is not being automatically wrapped in heading tags. Click CTRL + F and search for "h1". Make sure you only have one H1 tag on each page. Your title tag is the most important on-page SEO ranking factor when it comes to keyword placement. It’s the boldest, most attention-grabbing element in a search result, and has a significant influence on your SERP click through rate. It’s also good practice to keep title tags between around 60-70 characters. Any higher than 70 characters and they’ll most likely get truncated in the SERPS. Any lower than 50 characters and you’re leaving precious SERP real estate on the table. Keyword inclusion correlates quite heavily with Google rankings (according to Ahrefs), so you’ll probably want to include your keyword — or at least some variation of it — in the title tag. Again, there’s some debate about whether or not placing your keyword at the beginning of the title tag has any additional weight, so this is up to you. Title tag starts with keyword — not 100% necessary but works well for some pages; don’t force it at the beginning if it doesn’t make sense! Title tag contains “modifiers” — these are words like “best”, “2018”, etc; these won’t help rankings directly but they can help to increase CTR (which is a proven ranking factor) and map to intent at each stage of the funnel. Open a webpage in your browser, right-click anywhere on the page and select “view page source”. If you don’t see this on the page, you’ll need to add it. With HTML pages, this can be done by manually editing the code. If you’re using WordPress, you can use the Yoast plugin. Title tags help search engines understand what your page is about, and are the first impression people have of your page. Watch your length – refer to the length guidelines above. Don’t keyword stuff – avoid title tags that are a list of keywords or repeated close variations. It hurts the user experience, and search engines are smart enough now to understand semantics. Give every page a unique title – this might seem daunting when trying to scale across hundreds or thousands of pages, but CMS and code base templates make this much easier. 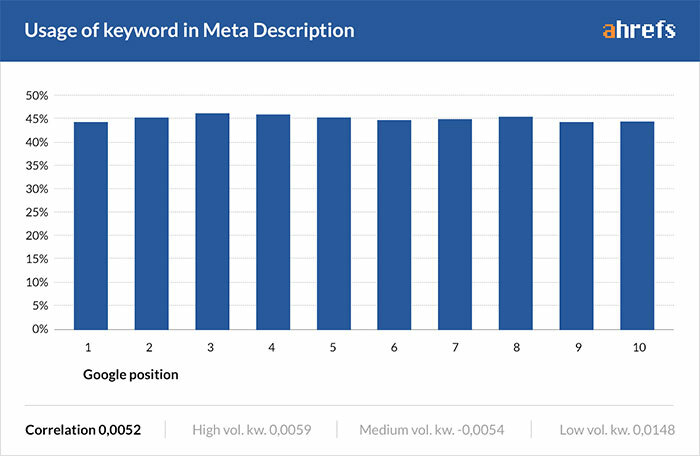 Put important keywords/LSIs first – while the jury is out on whether or not front loading keyword placement in the title tag has a direct impact on rankings, studies show user likely only scan the first 2-3 words as they scroll down the SERP. Therefore – you need to be writing titles that immediately capture the attention of the reader, and win the click. Avoid title tag structures like Brand Name | Major Product Category – Minor Product Category – Name of Product. This structure will front-load repetitive information that provides little added value to the reader. It hurts companies without an established brand even more. Take advantage of your brand – if you have a reputable brand mention it in the title tag to help boost CTRs. Always write for your customers – I saved the biggest for last. Always remember the primary goal of the title tag is to accurately capture the topic of the page and attract clicks from visitors in your target audience. I’d argue this correlation is negligible. Why am I including this in the on-page checklist? Because on-page SEO isn’t solely about doing the things that directly influence rankings; it’s also important to optimize for users. For this reason, incorporating your primary keyword in your meta description is still worthwhile, in my opinion. 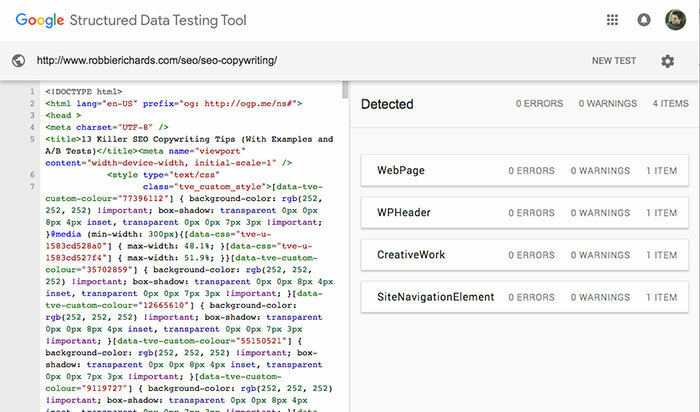 Use Google Search Console to identify which meta descriptions need to be optimized. This report will show the CTR for your top ranking pages. If you find some of your pages are ranking highly, but have a low CTR, update the meta description to be more compelling and entice the click. URL contains keyword — checks if the URL contains your target keyword; this is good practice (regardless of ranking correlations) as keywords in the URL are also highlighted in Google search results. Note: As I covered in the on-page section of this SEO case study, don’t force descriptive URL structures. In this case, keep the URL the same. The risk is far greater than reward when it comes to changing the URL structure just to force the keyword placement. No problem. Just try to keep the URLs as short and descriptive as your CMS will allow. There’s no evidence to suggest embedding videos on your page correlates with rankings. The sheet offers a simple “YES/NO” column indicating if at least one video is present on the page. All these factors increase the likelihood people will link to, and share your content. If you want to learn how to use a wide range of copy and visual hacks to keep people on your site longer, check out this in-depth SEO copywriting tutorial. “Alt” tags describe images, and improve the overall accessibility of your website. It’s what the browser displays to users with screen readers, or if there’s a problem rendering images. It’s good practice to add “alt” tags to all images. Google’s reliance on alt text keyword placement to accurately understand the contents of images is becoming smaller every day with advancements in machine learning. All metadata - alt text, file name, title - was stripped from the image and Google was still able to decipher (with almost 100% accuracy) the image contents. I’m not saying you should forget about image optimization, but you do need to look at it through a different lense. The goal should be to help Google better understand image context, and improve user experience. "Google uses alt text along with computer vision algorithms and the contents of the page to understand the subject matter of the image. […] When choosing alt text, focus on creating useful, information‐rich content that uses keywords appropriately and is in context of the content of the page. Avoid filling alt attributes with keywords (keyword stuffing) as it results in a negative user experience and may cause your site to be seen as spam." 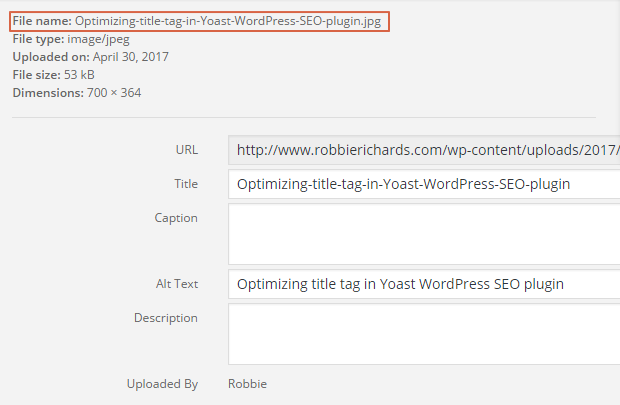 The on-page SEO template won’t give you information regarding every single “alt” tag on the page, but it will tell you if there are images with missing alt tags. These can then be investigated manually and fixed. It might seem negligible, but don't skip out on any chances to help search engines better understand the content on your page. Longer content generally ranks higher than shorter content. Search engines dislike “thin” content (i.e. short pages that provide little value to readers). Search engines need "food", aka content to determine the relevancy of a page/post for a given query. Not text = no food. A classic example would be a category page with zero unique content, and dozens of links pointing to different internal product pages. This provides little information for the search engine to understand the page. Not to mention a poor user experience. Google has cracked down on thin content,and the results were catastrophic for sites like freewarefiles.com that have thousands of pages filled with tons of links and very little valuable content. Check the spreadsheet for any thin content warnings. Review the page and look for opportunities to improve, update and relaunch the content. If it's feasible, consider no-indexing the page if it has zero search volume. The items in the previous section of this on-page SEO checklist could all be checked with automation template. In this next section, we’ll be looking at other important on-page optimizations that require a little manual legwork. Outbound links to related pages help Google understand what your page is about. It also helps search engines understand that your page is a hub of quality information related to the topic. This means outbound links can have a positive or negative influence on rankings; it just depends who you link to. It’s also important you’re linking to relevant pages. While you can scrape outbound links with tools like Xenu or Screaming Frog, the quality and relevance of those pages will need to be checked manually. Any irrelevant and/or low-quality links should be removed or nofollowed. Including relevant, quality outbound links in your content is a quick on-page SEO win. But, I see very few sites leverage it effectively. People don't want to send traffic (or "link juice") away from their site. Would this resource add value? Will it help the reader learn more? If the answer is "yes", and you are linking out to a relevant resource, do it! Use a tool like Ahrefs to get a quick top-level of all the domains your site/URL is linking out to. Filter the Domain Rating column in descending order to surface all the potential low quality sites your domain is linking out to. Click through to each one and determine if the external link needs to be removed. Note: just because it has a low Domain Rating doesn’t mean it is a bad site to link to. It could be quality/relevant content that is just hosted on a new domain. Search engine optimization (SEO) is fast becoming answer engine optimization (AEO). Even if you don’t rank in the #1 position, but manage to land a featured snippet placement, you can exponentially increase the amount of organic traffic to your content. There are a lot of different featured snippet types, and ways to optimize your content for them. 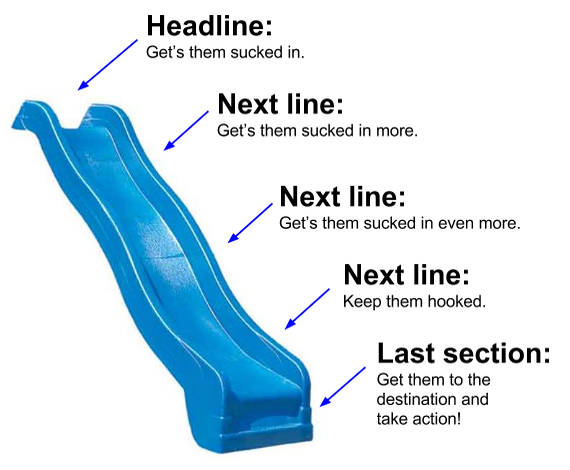 Rather than repeat myself here, I’ve put together a comprehensive step-by-step guide to landing featured snippet placements here. Broken links lead to a bad user experience. 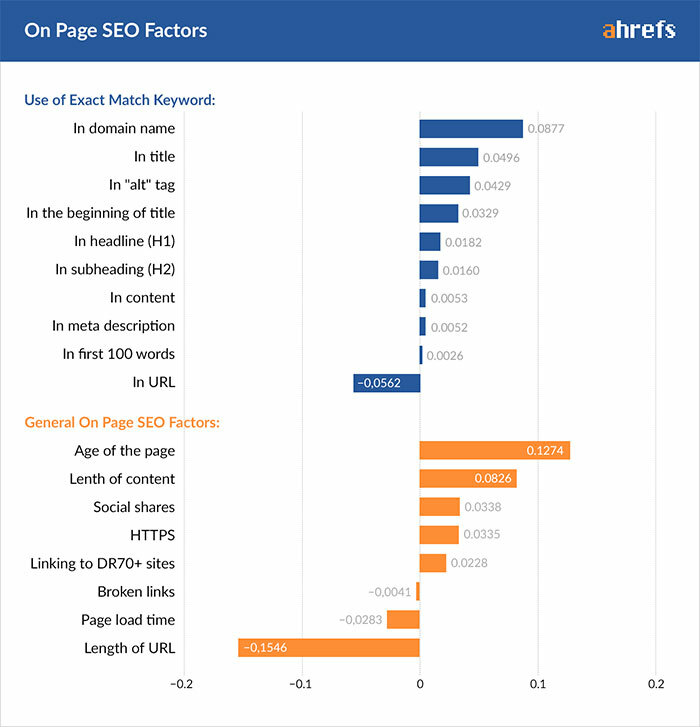 Ahrefs found, on average, only 2% of pages in the top 10 results have broken links. that site has removed or relocated content. Google's web crawlers travel around the web via links collecting data about each page, so it's a good idea to regularly audit your external link profile to ensure you aren't sending visitors (or bots) down a dead end street. If you have a small site, it's possible to manually check each page for broken links using a free chrome extension like "Check My Links". Once you've identified all the broken outbound links on your site, the next step is to fix them. 1. If the content can stand alone without it, remove the link. 2. If the link is needed, do a Google search and find a relevant replacement. Switch out the link. Google’s Penguin update back in 2012 penalized sites with over-optimized anchor text. Penguin only looks at anchor text ratios from links from external sites. It’s also worth adding links from existing, relevant, high-ranking pages on your site to new posts when you initially publish them. This will give your new page a nice boost (because of how inbound “link juice” flows between pages). This report will surface the highest traffic pages on your site. Scan the list of posts/pages and add a relevant internal link to your new article from a high-traffic page. Perform a site:domain “keyword” search in Google to see which pages reference the target keyword. I'm not telling you to page sculpt, but if you have some articles on the site that maybe don't get a ton of traffic, but have a decent number of quality links pointing to them, it's worth adding some internal links to strengthen the topical content silo and channel some authority into the new page/post. Search engines favor websites that allow them to identify and understand content. By creating silos - tightly themed groups of content connected by internal links - you can make it easier for search engines for sites to understand what your page or site is all about. "Siloing" content is a whole different topic on it's own. Instead of tackling it in this post, here is a link to ﻿an article by Ryan Stewart over at Webris. It's one of the clearest overviews I've read on the subject. Most of the time, you’ll mention target keywords throughout the content without even trying. Always make a conscious effort to incorporate your target keyword in the post intro. 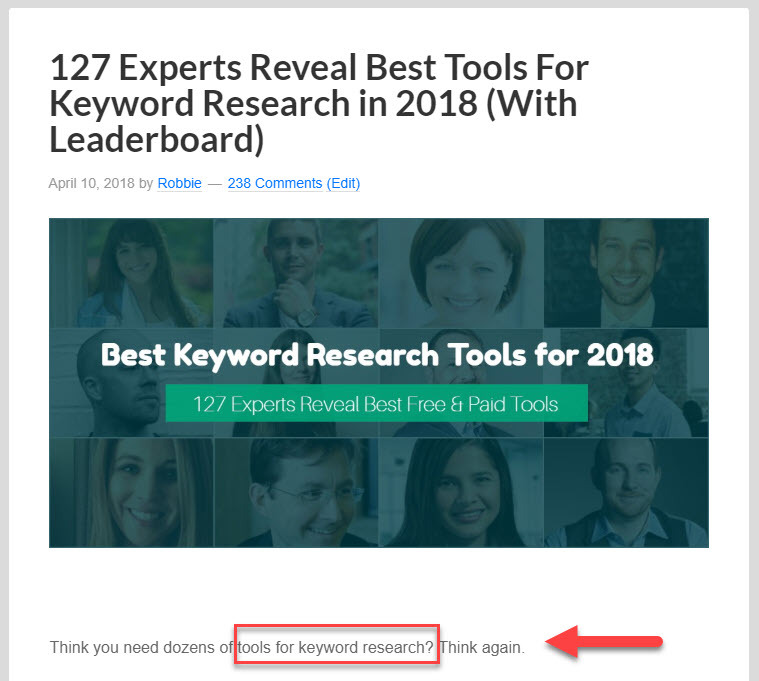 Notice how I mentioned the target keyword (“tools for keyword research”) early in the post intro? I also like to mention several synonyms and semantic terms throughout the intro and body copy. A lot of people start posts with long winded intros that don't mention the keyword or topic of the page until you're a few hundred words into the page. Don't wait to tell the search engines what the page is about. Include your target topic or keyword in the intro. Keywords are the building blocks of any SEO campaign. Due to Google’s Hummingbird update search is driven more by intent than exact match keyword placements. Google’s algorithm flagged ‘sparkling water’ and ‘carbonated water’ to be semantically similar and treats them as exactly the same thing. It’s the same reason why pages rank for terms that aren’t mentioned on the page at all. Yet, the article doesn’t mention the exact term once on the page. It has similar related terms and synonyms (e.g. 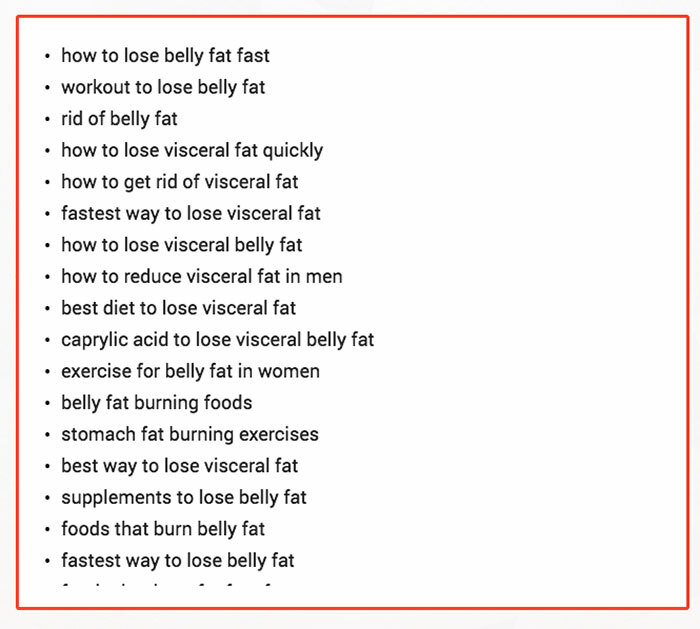 “effective tips to lose belly fat” and “reduce belly fat”), and Google is smart enough to understand these terms are related and relevant to one another. So, how can you optimize for this? Incorporate related terms and synonyms into your content. Create content using natural language and variations, instead of dumping the same keywords into your content over and over again. LSIgraph.com is a great place to find such terms/synonyms if you’re struggling. 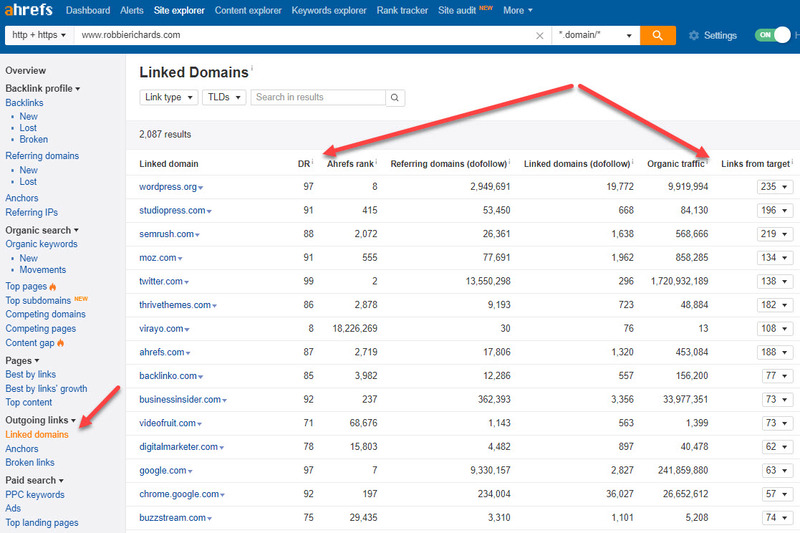 Or you can use a tool like Ahrefs to click through and view all the keywords competing articles are ranking for. 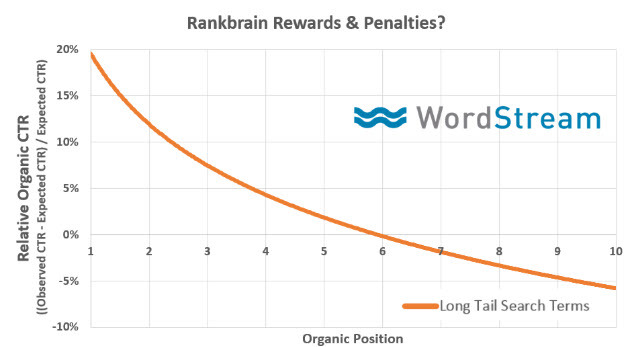 ​I recently came across this Moz article addressing one of the oldest SEO ranking factors very few people are talking about. TF-IDF (Term Frequency-Inverse Document Frequency) - a way to figure out how important a word is in a document based on how frequently it appears in it. While I recommend you read the full article, it basically highlights how a company was able to jump to #1 for the highly competitive search term "sales management" in just 3 months. One of the key factors behind the ranking increase was reducing the number of exact match keywords, and replacing with semantic variations within key on-page elements - headings, body copy and internal anchors. The case study further supports the fact that you need to be looking beyond exact keyword match, and focus more on search intent and semantics when it comes to strategic on-site keyword placement. You can find out more about using TF-IDF to measure content quality here. I’m a big believer that UXO (user experience optimization) is the new SEO. Google uses a set of different behavioral signals to assess user experience – CTR, time one site, dwell time, scroll depth, social signals and more. It doesn’t matter how well you optimize traditional on-page SEO elements, Google will drop you like a stone if users don’t engage with your content. Google even released an algorithm update back in 2014 targeting pages with top-heavy ads, because this doesn’t contribute to, well, a good user experience. Outside of mobile design and site speed optimization, one of quickest ways to improve the UX on your site is by using a range of multimedia assets and solid content formatting. And only 16% of people will read every word in your article. 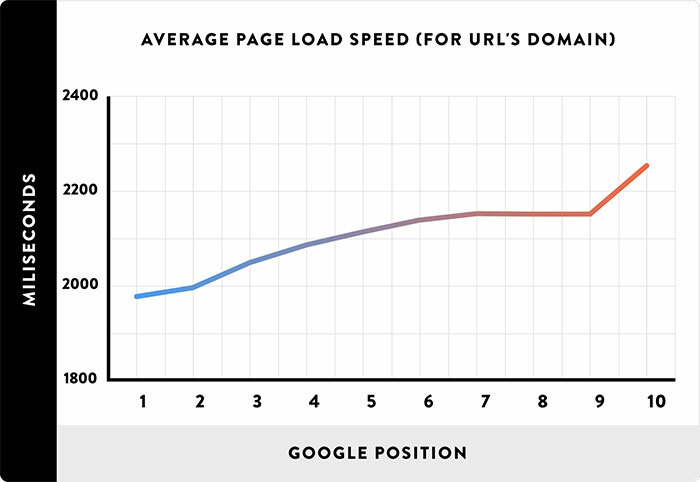 Google found that 53% of users will abandon a page if it takes more than 3 seconds to load. Site speed was incorporated as an official ranking factor way back in 2010. 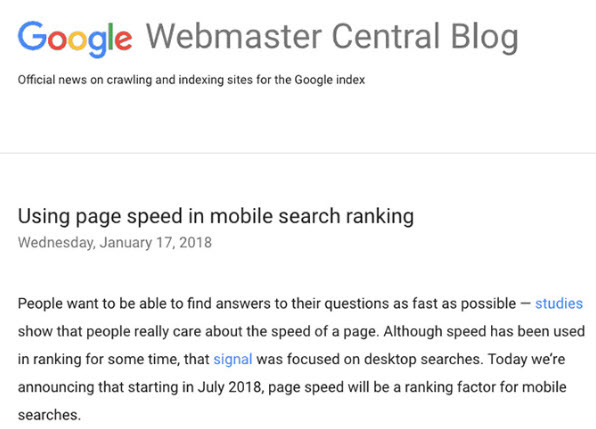 Plug your URL into the Google’s Pagespeed Insights tool and it’ll give you a grade (out of 100) across both mobile and desktop devices. It will also tell you which elements are slowing the website down. These should be fixed to improve page/site speed. Note: GTMetrix is another great tool for checking/optimizing pagespeed. The Aberdeen Group found that every 1 second delay in page load speed results in a 7% reduced conversion rate! The get an accurate view of all the major things slowing down your website, I recommend using several different free tools. Using multiple tools like this will almost always surface issues you would not have come across relying on a single tool. Definitely worth the few extra minutes work. Investing in a solid CDN or caching plugin will give you a nice speed increase. But, the best investment you can make will be in a premium hosting solution. While cheap shared hosting plans on sites like Bluehost are great when starting out, as your site grows a service like WPX Hosting can be a game changer. I cut my site load time by almost 30% after switching to WPX Hosting. Have you ever wondered how websites get“featured snippets” in the search results? How does Google know you’re talking about the movie Avatar and not a generic Avatar? Schema allows you to mark up this data and tell Google you’re talking specifically about the movie. This shows the kind of data markup you have on the page, along with any errors/issues. If you're trying to add schema markup and rich snippets to a WordPress website, check out this comprehensive guide. There are hundreds of different markup types. But, only about 35-40% of all websites are using it. The topic of schema markup is a post on it's own. 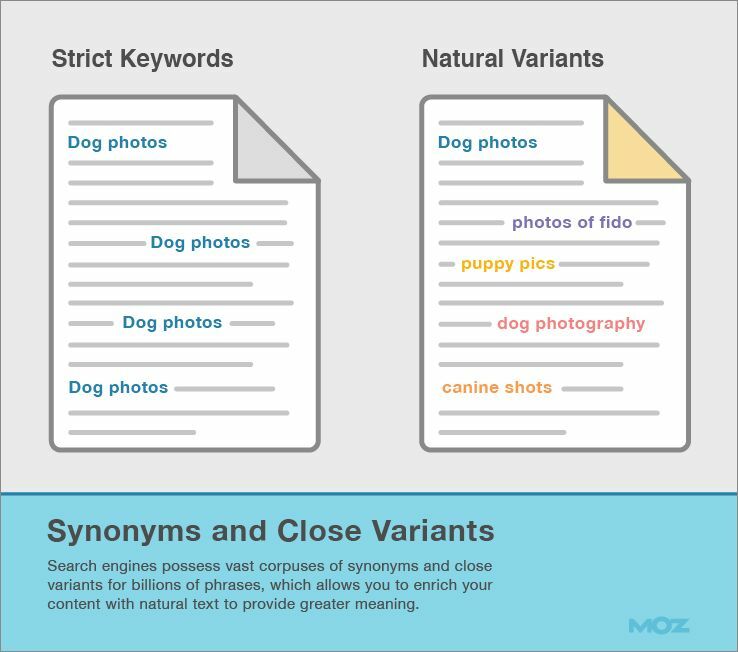 But, here is a helpful resource from the folks at Moz. Google has confirmed that social share counts aren’t used as a ranking factor. Simple. Google cares about “social engagement”. Google doesn’t look at arbitrary share counts, but rather the percentage of people engaging with, and sharing a piece of content. This is why I recommend everyone add social share buttons to their website. I’d also recommend adding social markup to your pages. This tells social networks (e.g. Facebook and Twitter) how to display to website when people share it. This will help increase CTRs and social referral traffic. Yoast is the easiest way to add social markup. If you’re planning to do this manually, check out this guide to social markup. In 2016, Cognitive SEO analyzed over 23 million social shares to see if there was a strong correlation between social signals and higher organic rankings. Some interesting insights emerged. While social signals are still thought to have little to no direct weighting in the search algorithm, there is a clear correlation. Social media is great for brand awareness, connecting with your audience, and getting more eyeballs on your content. And the more people who see your content, the more likely someone will link to you (which is a MAJOR ranking factor). Brightedge found that prominent social sharing buttons will increase sharing activity by up to 700%. According to the study, sites ranking in the top 4 positions typically had more activity on facebook. At the very minimum, set up the free Sumo Share app today on your site. It’s all well and good running through a checklist and, obviously, the template I’ve shared in this post makes life a lot easier. But, optimization can only be done well when you understand who you’re optimizing for and why. Track everything in Google Search Console and Analytics — this will show you if the changes have a positive or negative impact. I recommending adding an annotation to your Google Analytics report every time you make a change. This will help you more clearly map organic traffic and goal activity back to specific on-page SEO changes. Finally, download the Google Sheets template below and start automating the most time-consuming parts of your on-page audit and optimization. Wow, this is an epic post! Thanks for going above and beyond with the checklist, spreadsheet, and video. I have a three hour flight today which I think I’ll need to really absorb and implement these tips! Cheers David! Hope it’s helpful. Let me know if you think anything is missing, or needs updated. Love to hear constructive feedback. Wow. Really great post and write up. I’ve been noticing that most of the sites are going to https … this is something i need to get on and change with my site. I love the post. It’s not like the traditional write ups on this topic that you see. Its unique and very informative. Looking forward to downloading the automated stuff because why not make life easier, right? Thanks for the awesome tutorial. Is it possible to use a different tool like screaming frog instead of link profiler? You could technically use it, but this particular template is scripted for URL Profiler. It would need some rework. I just stumbled across your site recently, and have read almost every single post of yours so far. It’s definitely one of my top three favorite SEO blogs. This post was incredible. I will definitely go through each tip here and be implementing them on my websites. Awesome – thanks Ian! Pumped to hear you enjoyed the post. Just curious – what other SEO blogs do you read regularly? I can’t get any of the pop-up boxes to…pop-up! I want your spreadsheet, but can’t access the form to put in my info. Is it just me, or what? Never mind, it works now. Ok, great! Glad you got it sorted 🙂 Let me know if you have any questions. Thanks for the automation sheet, Robbie. I do have few points to make here. 1. You asked email address for the automation sheet only but I guess you are forcing your users to be your subscribers. I did subscribe thought. I liked your content. 2. On the slippery slope, you forgot to give the credit to Neville. 3. Last but not the least, thank you again for the automation sheet. I’m checking it out once I’m done with this. But if you ask me, I don’t agree with the first image you shared here from Ahref. I think the on-page SEO part of a blog is even better and more important than backlinks. This is because a site that is well optimized On-Page wise can even rank without backlinks. expecially if it targets a low competition keyword. Therefore, I think more attention should be given to that aspect anytime. I just downloaded the template. Hey Anil, definitely an important piece of the pie. A lot of it comes down to UX, which as we know is becoming more and more heavily weighted. Hmmm. I keep getting errors when it tries to pull my sites. All of my sites. And they all are valid with sitemaps. We’ve been having issues with the XML import script. If you log out and log back in that works most of the time. Otherwise might need to scrape with Screaming Frog to get the URLs from the sitemap before uploading to URL Profiler. Apologies for the workaround. I didn´t find where i can download. Could you tell me, please? You should be able to click the download link or image at the start of the article. A light box should be triggered where you can enter information to download the template. Thanks, Robbie. An epic tutorial and a great checklist. 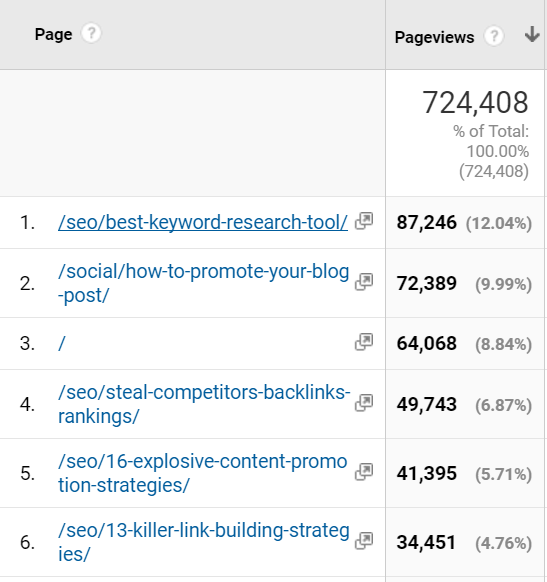 This is also a good time to check the keyword optimization (after the posts/pages are initially written). You can tell when a post is written from the beginning with the sole intention to rank for a keyword (not a good thing). But when pages are written with the reader in mind first and designed to help them, THEN optimized for keywords once the ideas are in place, it adds up to a great combination and user experience. Excellent piece with very, very helpful tips. If one of our big sites got hit by Fred, and many of the pages include thin content (and we have not investigated backlinks yet) should thin content pages be removed ASAP since revisiting them could take some time, or should the old URLs be retained and then updated over time to keep the page count? In sum, is it better to delete content that is thin than take a long period of time to make it what is now considered rich? Update and relaunch articles positioned 6-20 that can provide value to your customers, and business. Remove article that don’t offer value, have zero traffic, links and conversions. 301 redirect content that has links pointing to it. Sometimes it might make sense to consolidate that content into an existing related asset too. This was a great article. I learned so much. Thanks for taking the time to educate us on ON Page SEO. Hi, thanks for this usefull post, but i can´t download the template, could you check it please? Were you able to download the template? Hi, thank you for sharing 🙂 I have a question, will this work for other languages? Yes – as long as you are setting the right keyword targets and setting SEMRush language filters correctly. Hey man – curious… how long did this take to pull this all together? Like right from the idea to clicking publish?? Cheers? Really great post mate. Thanks to Josh as well. This will be handy for quickly checking the on-page side of things. I’m a new follower and instant fan. This is the first post of yours that I’ve read and it’s fantastic! So detailed and reassuring to find someone who approaches on-page SEO in the same way as I do. The tool looks amazing, I’ll have to give it a proper go when I get my new site up and running. Thanks Heather! Let me know how it all goes, and if you have any questions about the automation template? Super in depth man. Thanks. Thanks for sharing.. Amazing post… All important factors are cover, it’s a really easy way to understand follow these steps..
Hey Robbie, This was great article. I have one query and that is whenever we write any article we do internal linking. I am having a tech niche blog. Whenever a paragraph ends I do internal linking like this one. Also checkout: Top 5 best torrent clients for Android. This is the proper way??? If I will include this in paragraph would be great??? 1. Whenever possible, link with keyword-rich anchor text to other relevant content on your site. Ideally, you’ll use internal links to create a content silo on your site that connects all related topics. For example, I would link between all link building topics, and then link between all articles related to keyword research. 2. Pull up a list of your highest trafficked and linked-to pages. Try to link internally from those to new content as well. The approach you mentioned is fine too, but I’d look for anchor text options, build silos and try to link to new content from higher ranking/authority articles on your site to help get the content crawled quickly, and channel authority and traffic to it. Very thorough and useful, Robbie. Unfortunately, a large number of business owners don’t even know what SEO is. They just go with: “I’ll put my website out there and my sales will go high”. But, without good optimization, they can expect nothing. Thanks Steven! Yep, on-page is one of the simpler SEO areas, but it always amazes how many sites fail to focus on the basics. You have analyzed very deeply. Insightful article. Thanks for the resource Robbie! I only discovered your website about two months ago through GrowthHackers, but it’s literally one of my favorite places to come! Thanks Joshua and Robbie for the checklist – this is going to save so many headaches! Very in-depth article. Appreciate the hard work you have put in. You haven’t mentioned much on the keyword density we need to maintain to make sure that we don’t over optimize anything. Any insight on this? All in all great work mate. Great in-depth post! Really appreciate sharing this. But am I the only one who can’t download the Automation Template? Hey Oscar, sorry for delayed response. Did you get it downloaded? This is fantastic! It is so true that on page SEO is vital to get right and great to see such an in depth look at it! Thanks for this in depth on page SEO article. There are a few things I was not aware and now changing some of our practices, like taking time to tag our images.How about the content itself and the length of content, does this have any weight? First, I would like to say thank you because the amazing stuff you shared above. Second, The information you shared is deeply described on on page factors. first time I incident visit your website and really attracted by your great content. Keep share good stuffs more, as I want to learn more from you. Really thanks for helping people who do online marketing and through your content it really helps. Great article with tons of useful information but like the others, I was not able to access to download. Thanks Saied! Please send me an email and I’ll get you a direct link. Best on page optimization techniques for better ranking in Google. I’ll sure bookmark this page, I’ll checkout this post when ever I get lost in SEO. I really want to thank you for sharing these great techniques. Also, brilliant presentation with tutorials. Securing site by HTTPS, update page load speed, making site user-friendly, mobile optimization, broken link fixing, fixing 404 error, image optimizations all these steps are really useful for on-page SEO. Thanks again for this great useful post. After reading your post, I made some changes on my blog post. Hope those methods also work for me. Sweet – let me know how it goes. Excellent post, Robbie! It looks like you are going be the next Brian Dean and/or Neil Patel. Thank you! Haha appreciate the compliment, Akash! No doubt blog is really informative but it’s too long like intensely we make it long which make bored while reading it, and second Ahref is paid tool, please try to introduce some free tools which make easy to use and pocket-friendly. Ahref is all in one tool but if someone want to use to free tool. he can use multiple tools for multiple matrices. So try to add them also. Excellent Post, But the template link is not working. Thanks for the heads up, Anshul! I’ll take a look. Thank you Robbie for putting this together for us!! I can tell that you have put in a lot of research and effort in compiling this post. There is so much to learn about On Page SEO that I can’t seem to ever get bored of it!! For sharing great tips for on page of website. This is some post Robbie! I’ve been reading you work for some time now and I’m always amazed at the time and effort you put in. There will always be a place for in-depth, high quality content like this. Many thanks for the template. Thanks John! Really appreciate it! Great Statistics to reinforce your great ideas! What a fabulous article Robbie. I was struggling to create an SEO checklist for my website and your article is a complete savior. My best wishes to you. Keep up the good work. Awesome article! Thanks for sharing well-explained SEO checklist! Your article is very easy to understand. Hmmm… I’ll take a look. Which link? And where? Not seeing it on my end. First of all what a great article, you just explained every detail in a very informative and easy way. Your explaining style is unique and the way you explained about the on page was outstanding. I m looking forward to read more articles like that from you. Thanks again for sharing with us. Thanks Muhammad! Glad you enjoyed the content. What specific questions do you have? Thanks for sharing this helpful and informative article. I would like to say that your post is really impressive. I was searching for On-page SEO tips and I found your article, firstly I think it similar to other bloggers but after reading your whole article I am really shocked. It is a unique and well-polished article. You explained too many important points that are really helpful as On-page point of view. I appreciate your hard work and dedication for this awesome article. Keep posting and sharing new updates with us. That was a beast of an article!. I’ve been blogging for a couple of years and picked up a LOT from thi, so well presented and easy to follow. I am definately adding you to my list of SEO experts to follow. Not sure what is going on there. The link works fine for me. Are you referring to the link on the download page? Looking into it. Thanks Hardik. Great tutorial, I was hoping to take a look at the template that you have created but it says the file is not available. Would you mind emailing this to me? This is great and I recently got out of high school and about to go to college and really want to learn more about website audits and the do’s and don’t’s of SEO. I am also exploring VSO because I think voice and schema (structured data) will be important. Thanks for sending me the template, I really appreciate it! Thanks Mark! I’ll take a look. Are you referring to the template link you receive are entering your email? Such an extensive and in-depth list for on-page SEO definitely one for me to add to the bookmarks and to read again and again to keep my on-site SEO in check. That’s a Great and In-depth Tutorial Robbie. You are Rock Robbie. A superb detailed article in deep on On-Page SEO. Thank you for sharing your SEO knowledge with us.